Exploring opportunities and experiences for interdisciplinary collaboration, these blogs look at what happens when you bring together Engineers and Artists to work on a project together. Having worked on the early stages of this project researching the history and hydrology of flooding and drainage in the Somerset Levels I thought I was well prepared for the art stages to follow. I was decidedly wrong! The first workshop involved making a standard engineering-style poster containing information in the area our group had chosen to focus on; in my case the future of flooding in the region. This was a pretty standard summary of climate change impacts, land use change and a critique on the present policy which will shape the region over the next 5-20 years. The next workshop saw us transform this information into a more ‘arty’ format. We chose a newspaper style article from 5 years in the future. In civil engineering (my undergraduate background) there’s a strong perception that the public don’t know anything about engineering and that they demand only bottom-up management towards their own interests; and this was definitely present in my article. Regardless of the truth or fallacy in this assumption, taking this attitude will not gain you public support for your project and, importantly, you will very likely miss out on important information that stakeholders could provide you with. Each group began work with a Somerset artist to create art out of their topics and ideas. Our group is currently putting together a ‘flood survival kit’ containing items which aim to bring together ideas about the impacts and mechanisms behind flooding. Putting this together has been constant interplay between engineers looking to add purpose to items and our artist looking to reduce purpose with a much heavier use of metaphors/symbolism. Items include purpose-heavy hand-made water filters (from drinking bottles and sand!) and metaphor-heavy sponges and boats (made from Somerset clay). Additionally our group will be inscribing rocks around Somerset with a text-number which will provide flood relevant proverbs or information when a message is sent to them. This was inspired by tsunami warning rocks in Japan! An original tsunami warning rock in Japan courtesy of the Huffington Post, 4th June 2011. 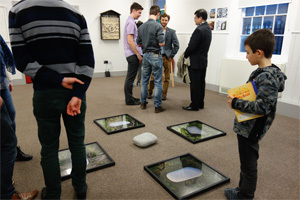 On 25th March, all the groups presented their projects in an exhibition in the Exeter Community Centre. Our most valuable return on these projects are the skills in working with the public we will gain. After all, even capital projects designed with a stakeholder’s desires and demands in mind won’t work if the stakeholder rejects them. The pre-industrial history of the Somerset Levels illustrates this perfectly as drainage works in the region have typically been vandalised and prevented from working due to public opposition (an interesting contrast to the present dredging-heavy mentality!). The Somerset Levels and Moors are a low lying region prone to frequent flooding due to a range of environmental and human factors. The history of drainage and flooding in the Levels is rich and unique, its present condition is unstable and its future uncertain. Winter 2013-14 for example saw extensive floods in the Levels that attracted a great deal of media attention and conflicting opinions on what to do how to prevent this from happening again. 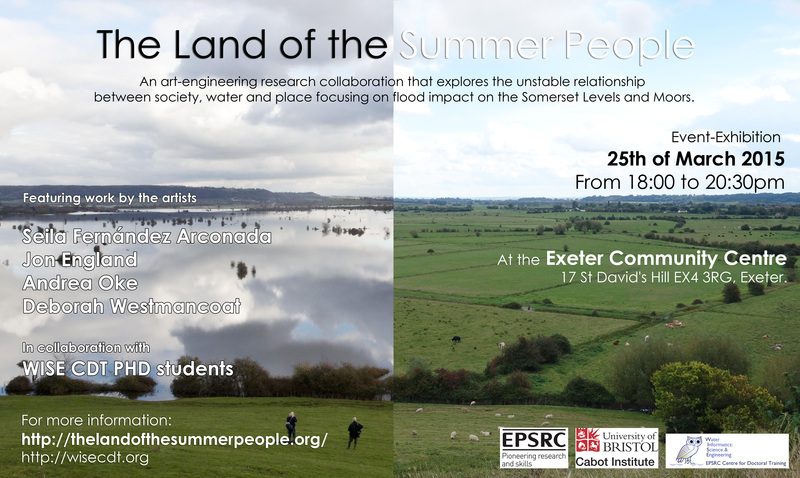 The Science & Art project brings engineering PhD students together with local artists, to increase public awareness and understanding of the Somerset floods. Scientific understanding and traditional engineering tools are combined with the artists’ creativity, in an effort to make discussions about the area’s history, present and future more accessible and enjoyable. Coming from an engineering background, the prospect outlined above slightly scared me at first. As an engineer, you rarely use art as a tool in your work and, funnily enough, doesn’t appear during your university courses either. The few interactions with artists (as colleagues in a bar) and art (sporadic museum visits) left me very sceptic as to the success of this cooperation. Sure, art can be nice to look at, but what is the point of it when you’re trying to convey the results of your studies on flood risk? This project is divided into a couple of workshops, and the differences between engineers and artists was apparent right from the start. We (the engineers) tried to convey as much knowledge about the Somerset Levels as we could cram onto our posters. Dates, history, water safety plans, references, whatever information was available. The artists then showed us some of their work. We saw sketches of landscapes reflecting in water, paintings of local soldiers in shoe polish and visual representations of sound waves to name a few things. For the next workshop we were asked to change our original posters in any way we saw fit, based on the things we picked up from our first art workshop. This turned out to be not as easy as we’d hoped. After years of being trained to present information in a thorough and accurate way, making the necessary switch to create something that could be called artistic is difficult. We mostly managed to present the, admittedly dry, material on the posters into a somewhat more appealing way. The idea to do something else than conveying information was still difficult to bring into practise. As the artists kept reminding us, it is not always necessary to convey knowledge to the viewer of our work. Sometimes it is enough to make someone think about a certain topic you think is important, or to simply present some specific theme in an intriguing, appealing or interesting way. In the third workshop we began to form ideas based on this line of thinking. Transferring information and creating knowledge for the viewer are still important parts of the work, but they have become secondary rather than primary objectives. Now we’re hard at the work to make our ideas become reality! These workshops have been good to show some perspective. As a specialist, you would normally want to present as much of your gathered information and knowledge as you possibly can, but this quickly becomes overwhelming for someone unfamiliar to the topic. Collaborating with artists can be a good way to introduce a specialised topic to a wider audience in an entertaining and accessible way, while at the same time teaching us how laypeople might think about our subjects.